A couple of months ago I hauled a bunch of product from iHerb.com (more on that here) and thought it was about time I started reviewing some of the items I purchased as promised. 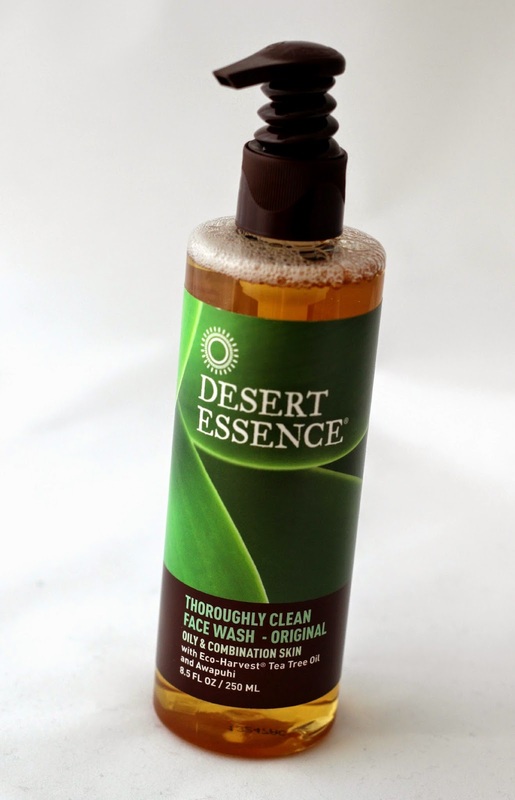 I thought I would start with the Desert Essence Thoroughly Clean Face Wash - Original since I have been getting a lot of use out of it. I had heard about the brand previously, so when I saw that the website carried their products I decided to give some of them a try (I also got their concealer, but more on that in a future post)! 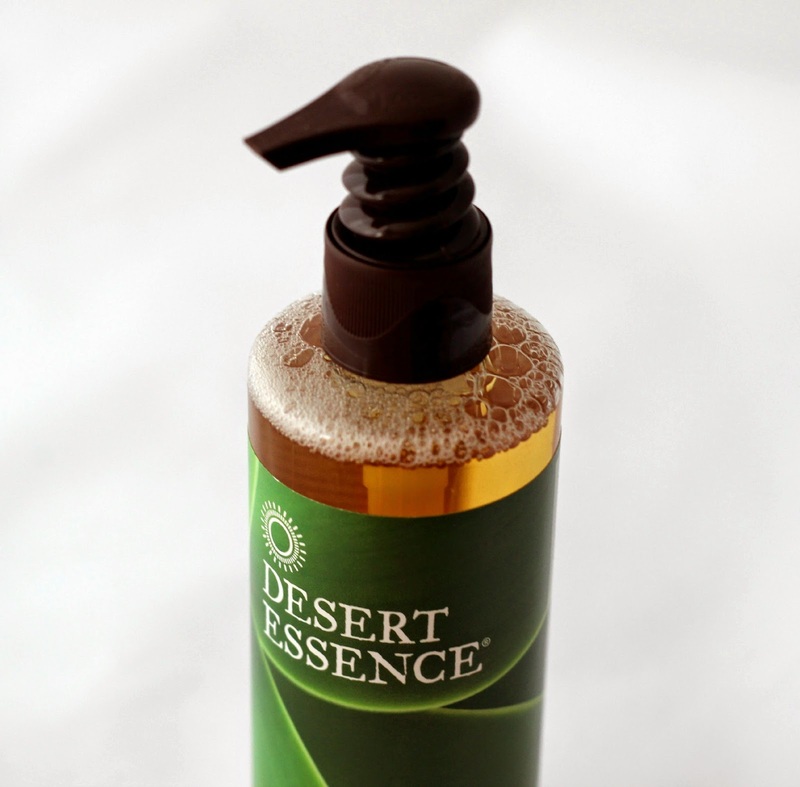 Desert Essence is a vegan-friendly company, meaning products that are gluten, paraben, cruelty, and phtalate free, with all of their ingredient being derived from plants. Their products are made in the USA and contain only the best and purest ingredients. 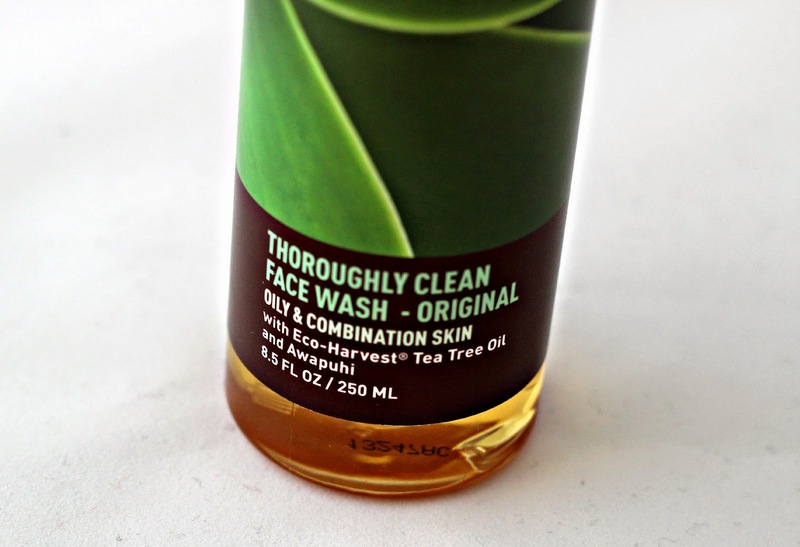 The Thoroughly Clean Face Wash - Original is formulated for oily and combination (only mostly in the T-zone) skin, with one of its main ingredients being tea tree oil which has been found to aid people dealing with acne since it is a known antiseptic. Looking at the generous list of ingredients, stemming from coconut oil, tea tree leaf oil, lavender oil, calendula oil, chamomile oil and extract, to Hawaiian White Ginger and Goldenseal root extract, among many others, it comes to no surprise how much my skin has been absolutely loving this stuff. I actually feel like it has helped calm down my breakouts and redness and it is super gentle on my sensitive skin. Despite containing all of these various essential oils, it does not feel greasy whatsoever - on the contrary this face wash is actually very runny, almost like water which makes rinsing off an easy task. I have been especially enjoying applying this cleanser at night to remove my face makeup since it dissolves it so effortlessly. I simply massage the product in circular motions for about a minute (since it is free of chemicals it does not lather nearly as much as non-natural products), rinse away, and I am left with a squeaky clean face. The only downside with this product for me initially was its scent - probably the strongest scent I have ever come across in a face wash, which I assume comes from the tea tree oil or ginger root extract. It is quite pronounced, and although it took me a while to get used to it, I have grown to no longer be phased by the scent nearly as much as when I first started using it. Considering how much my skin has been improving from using it, I definitely plan on repurchasing it as I am almost out. For only $6.24 US, this face wash is definitely an acne-prone skin savior. If you'd be interested in trying the Desert Essence Throughly Clean Face Wash out for yourself, make sure to use code FFM227* at checkout on iHerb.com to get an extra discount (they ship internationally at a low flat rate too). They also make a variation of this face wash for normal skin as well here, so there is definitely one fit for your needs! Have you heard of Desert Essence? Make sure to let me know in the comments below if you have any natural beauty product recommendations, or any DIY recipes you think I should try when it comes to natural skin care! This sounds like something fit for me. I've heard of the brand before, but I didn't know they sold facial products for some reason. ~Having a looksy into the product now! I love Desert Essence products, especially their haircare! I really like the sound of this product! I am in need of some new facial products and I would rather use as natural as possible. The ingredients sounds great and so does the price. I have been using a lot more natural face washes and body products...trying to anyway. This sounds like a great cleanser, I really want to try it. Thanks for a great post!